Cooking without a Net: Color Me Excited! I don't know which ones to look at first! 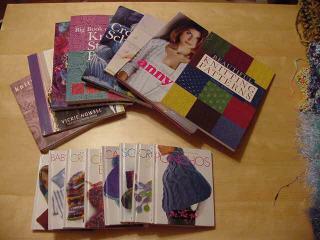 Can you see there on the top left is the new edging book, Knitting over the Edge? And all the Vogue on the Gos? There are some crochet books and stitch pattern books and a great Anny Blatt collection. I gave her a wish list to pick from and I think she sent almost everything I put on the list! I am truly blessed to have such generous friends. Obviously, this post will be short . . . I have some books to play with! Yesterday I went with some friends to see a production at the Gallery 37 Storefront Theater called Six Stories up on Mt. Everest. It's part of a mentoring program that pairs six school children with six mentors to write a theater piece based on their personal experiences. This is from the program: "Adults and children with and without disabilities, of all races and income levels work together on equal terms." It was terrific, funny and inspiring. I'll post photos of the scarf tomorrow.